Good morning! We’ve been super busy at the Party Girl headquarters working on some pretty major announcements. We’re hoping to have those to you by the end of the month, but until then we are still in full summer mode, which means BBQs, campfires, and of course, baking and crafting to share our projects with you guys! In honour of my favourite summer meal (do burgers and fries even count as a meal? 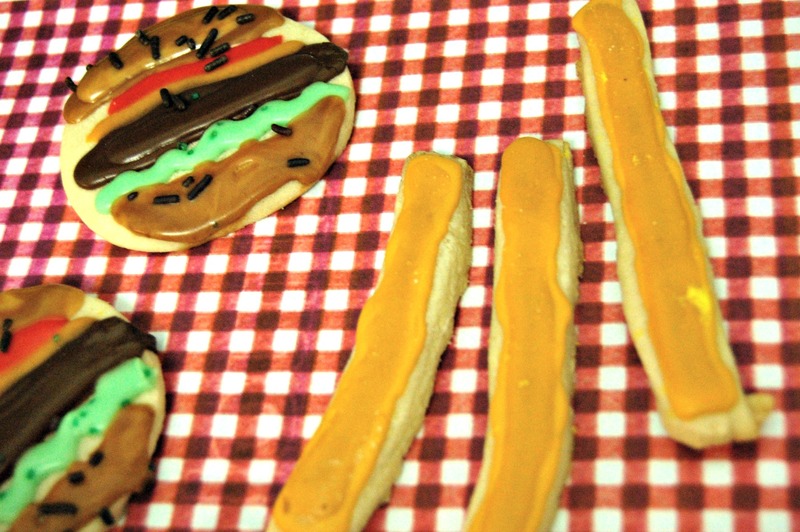 Probably not…) we made these adorable (if we do say so ourselves) hamburger and french fry cookies. 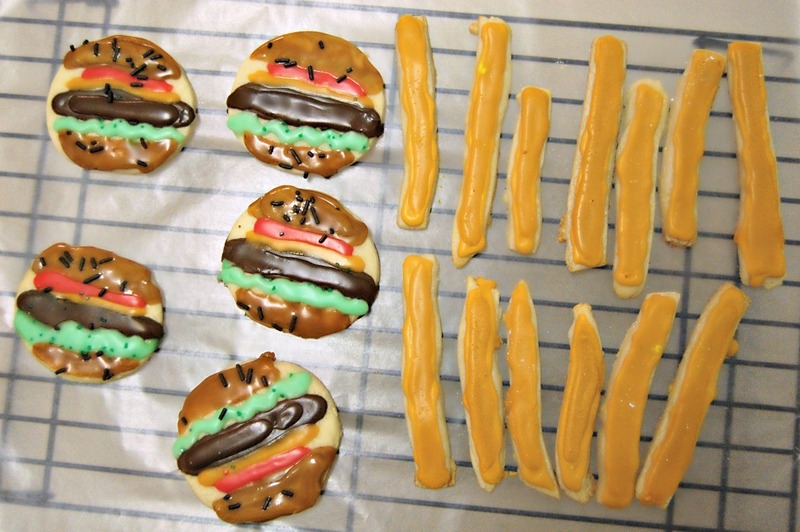 I insisted we make these because I’m a freak and obsessed with burger themed desserts, but I’m actually so glad because they turned out super fun! And now you can make them for your next BBQ! 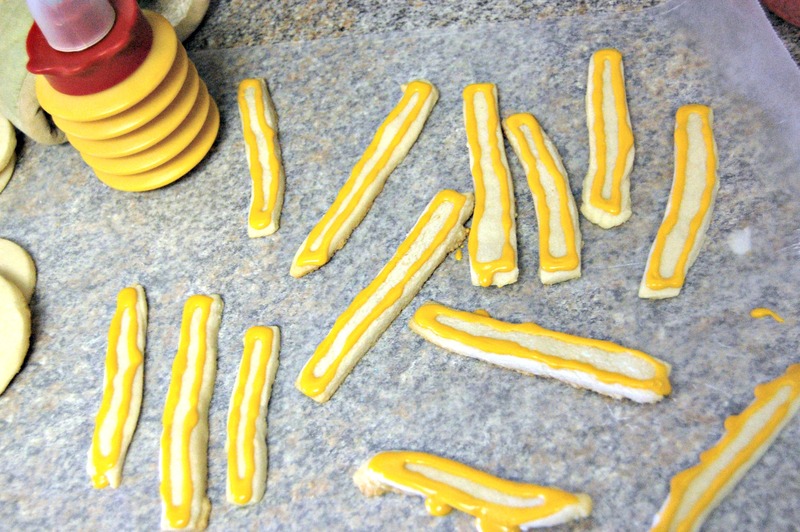 After you make your sugar cookies, use a circle cutter to make the “burgers”. We experimented (okay, I experimented, Fernanda was all for cutting them in the first place) with different ways to make the french fry shapes, but we [Fernanda] decided a knife was the best bet. And it probably was. We weren’t too concerned with making them straight because french fries aren’t perfect in the first place. We cut different shapes and let the oven make them more unique. 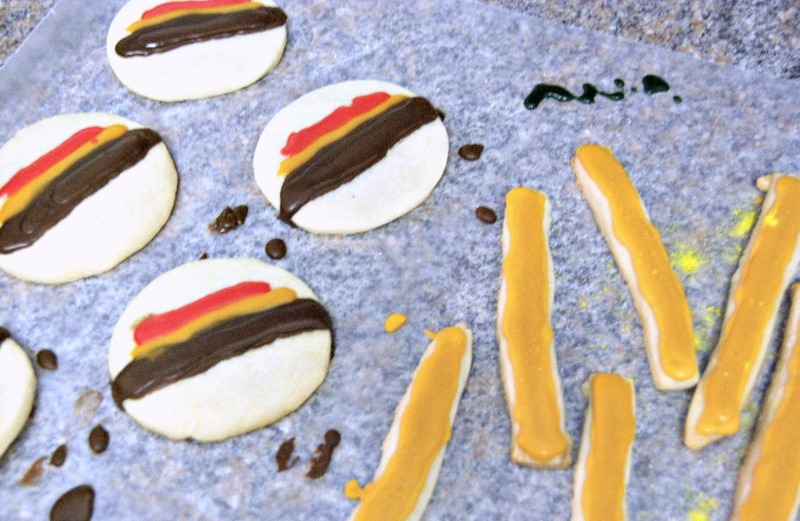 After your cookies have cooled, it’s time to decorate! Put down wax paper if you’re a messy decorator (like me). 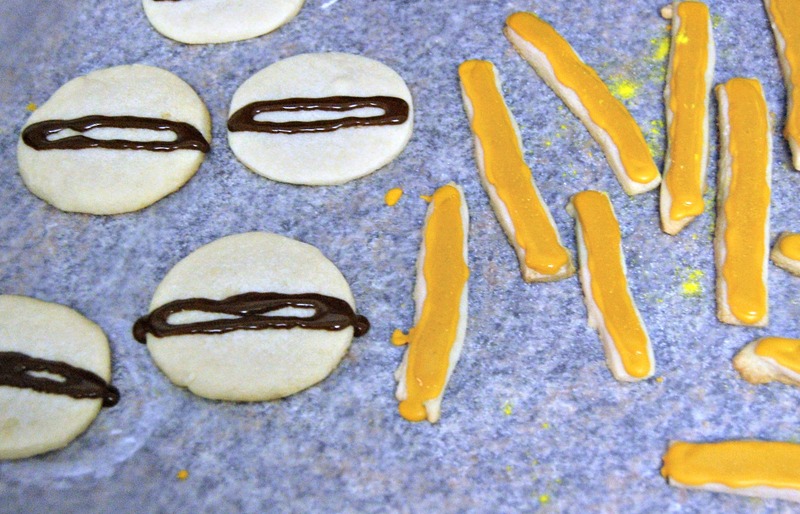 Draw an outline around your cookie and let the icing harden (about 10 minutes). After the icing is a bit stiff to the touch, you can come back and “flood” the rest of the cookie, filling in the outline and using a small knife to spread it around. The outline should be firm enough to hold the new icing. 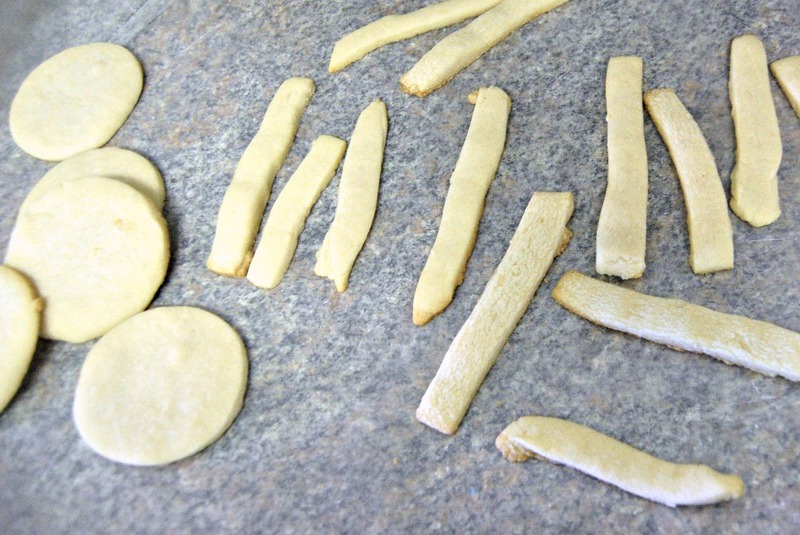 Once I filled in the french fries, I sprinkled them with some granulated sugar (don’t judge, it was barely any, and what do you think sugar cookies are made of anyways?) to look like salt. When you’re doing your burgers, its sort of up to you how you want to do them. I started in the centre because I figured if I started with a bun I’d misjudge my space. I also mixed a ton of colours to get that dark a brown because the only brown dye I had was very light and that wasn’t good enough. Just as a side note. Also, be patient. You can clearly tell which cookie I started with and which one was last. If you find your icing is too runny, mix in some more white, or pop it in the fridge for a few minutes to thicken a bit. I tried not to be too linear with my “toppings”, but I think they turned out cute even if they are mostly straight lines. You could go another route, getting more detailed with the cheese or drawing tomatoes if you’re artistic, but for a simple design just the colours still managed to tie it all together. It was really hard to get a good relish colour. I opted for a brighter green one mostly because I ran out of white to tone it down, but also because the dark green took away from the colourful aspect which bothered me. I’m neurotic though. Do what makes you happy. For the buns I sprinkled some chocolate sprinkles to add dimension, but clearly got a little heavy handed with them and they ended up all over the cookie. The goal was to keep them on the bun. I don’t know I was probably multitasking. Can we just take a second to admire how frigging cute those burgers are on the cooling rack? It’s like a BBQ grill! I had this whole styled shot laid out with BBQ tongs and stuff but Justin said it was too far. I was considering lighting a small fire for atmosphere, so maybe he was right. And that’s that! 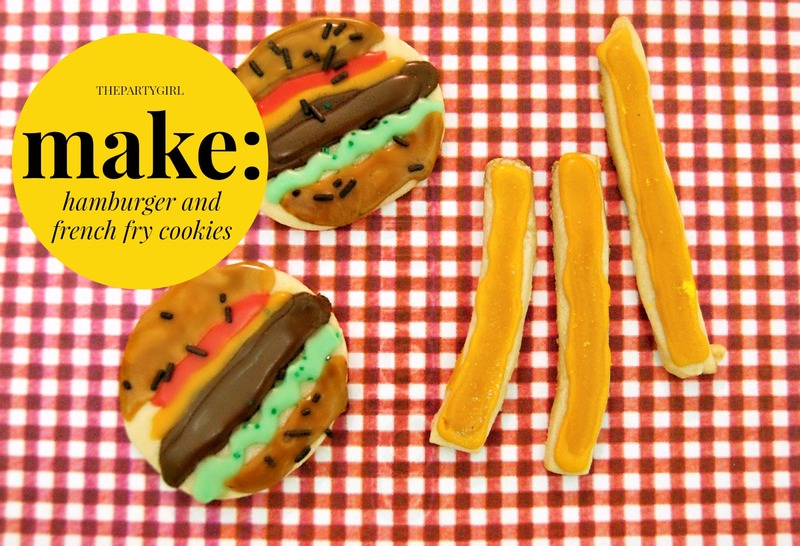 Give it a try and make your own BBQ themed cookies, they make a great conversation starter!